Photos of my kitchen makeover. Here are photos of the makeover. The previous owners had installed brick facing on the walls. It was horrible as it had jagged edges and was uneven around the windows. The outlets hadn't been moved to the top of the bricks and so were recessed and hard to use. The cabinets were yellow with age. I removed all the bricks by using a hammer and pounding them to pieces. I did that on and off for a couple of weeks as I had to rest a lot. Once that was all removed I had to sand and clean the walls. A nice coat of blue paint brought new life to the kitchen. I rested a few more days before tackling the cabinets and they took almost an entire week as I worked slowly. The final touches were the new hardware on the cabinets, painting the stove hood, and installing stainless steel tiles. I bought a navy blue curtain for the window. I love the look. But most importantly, I was able to work hard without my back hurting and for long periods of time. I did wear my back brace throughout most of the work. I know now that my physical therapy worked and my stamina's improving. I'm thrilled to be able to do things that I haven't been able to do in many years. We still have more work to do in the kitchen. 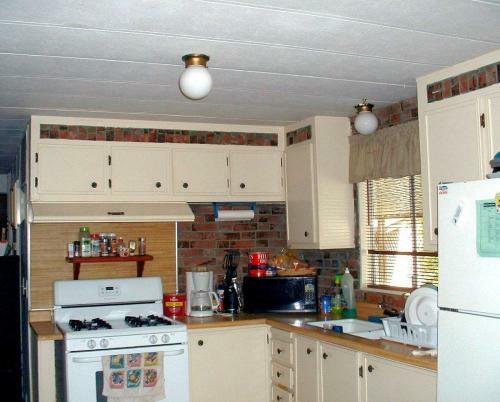 We need to replace the counter top, lights, sink and faucet and get a disposal and dishwasher. But until we can afford to do that, we're happy with the makeover. I'd like to mention that this is a 30 year old double-wide mobile home. The kitchen is very small - more of a galley. 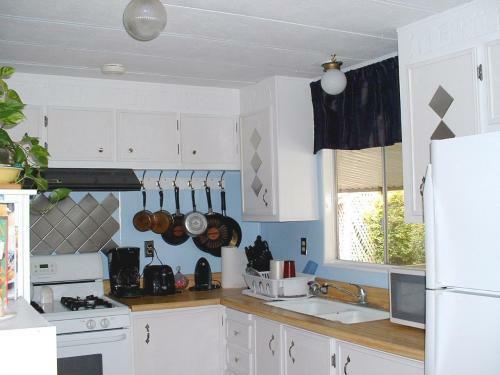 I think the white really brightens the kitchen and makes it look more roomy. Also, I did all the work by myself (Hubby's helpless when it comes to being handy.) And I had spinal fusion surgery a year ago. So, I'm doubly proud of myself and the work I did. Oh, and I'm 59 so the spring in my chicken left a long time ago ~ LOL. Your kitchen looks like a total different kitchen.It sure looks great. You did a fantastic job, it looks very professional. Light and airy and certainly larger than before. What a BIG improvement. Neither wonder you're proud of yourself as your new kitchen certainly looks much bigger, lighter and altogether more modern. I really like that shade of blue with the white. Well done!! Thanks! I can't wait to get everything else finished. Hopefully we'll be able to have a counter top installed in a few months. It sure looks pretty now, Eileen. Congratulations on a job well done - you should be proud. I know how it feels to have relief from physical restrictions and you certainly have. Way to go !